Non-profits present budget challenges not ordinarily present with conventional for-profit companies. FileMaker's rapid development capability allows very fast development, with commensurate lower development costs, without sacrificing the graphical user interface (GUI) or capabilities. Also, FileMaker offers pre-made database designs for various applications that can be later modified to suit the company's needs. FileMaker is the ideal platform for fast, low cost development. 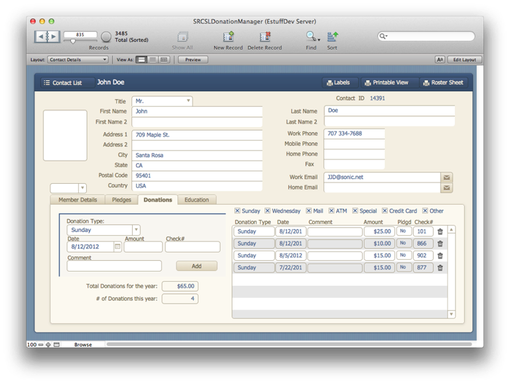 Donation Manager (shown above) is a low cost, fast start, FilemakerPro file which provides management for memberships to any size, including non-profit organizations. Example uses are in places of worship, clubs, professional societies, and any kind of member-supported organizations. It is designed for easy modification for a beginning FilemakerPro 12 user. It manages pledge drives, donations and generates emails for a variety of automated uses. This organization provides financial and fellowship support to the nation’s most remarkable PhD students in the physical, biological and engineering sciences. Their FileMaker database is used to track candidates, accomplishments, grades and awards.